My Pale Skin: 3 Food Blogs I just can't stop reading & a Lifestyle change. 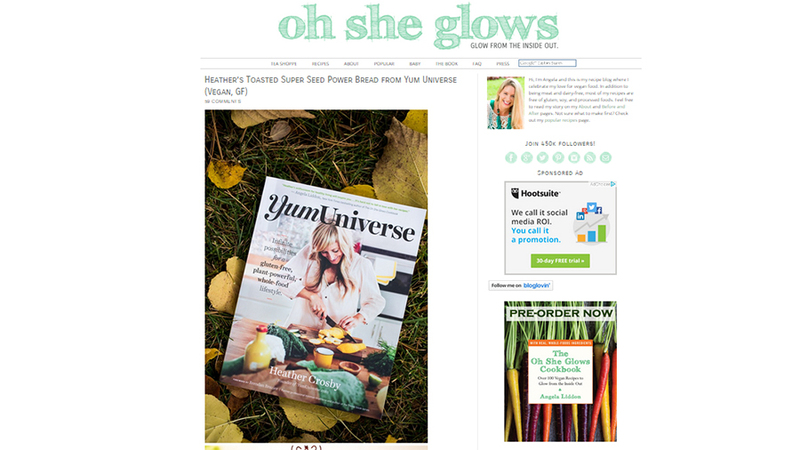 3 Food Blogs I just can't stop reading & a Lifestyle change. Food is something that I've always had a love hate relationship with... I love to eat, but it seems that almost everything I enjoy eating, doesn't feel the same about me. I've been Vegetarian for 15 years and in my teens I turned vegan for a few years before reverting back to Vegetarianism. I've always felt that it was my personal choice and I never wanted to be a 'preachy vegetarian' as that simply isn't my style and most people don't realize i'm Vegetarian until they have dinner with me. Over the past few years I've been noticing more and more a change in my body - especially in regards to foods. After trial and error over the past couple of years, I've learnt which foods to avoid and which make me feel happy and healthy and what I've established is that I feel the best when I stick to a plant based diet, or a meal made fully of vegetables. So I've decided to try and go for it - cut out the crap and just eat good foods that don't hurt me. In search of inspiration for new meal ideas, I turned to the blogosphere and instantly fell in love with these 3 blogs and wanted to share them with you. 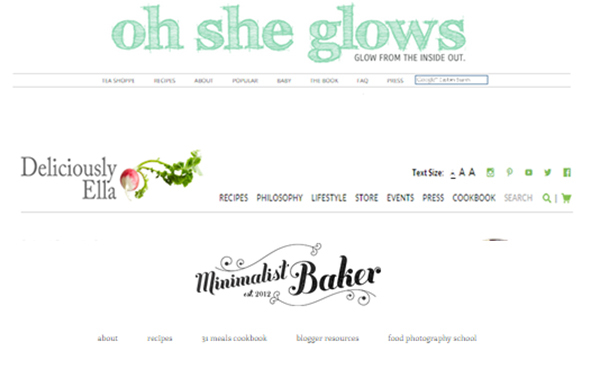 Oh She Glows is a Vegan Food & Lifestyle blog by Angela Liddon. 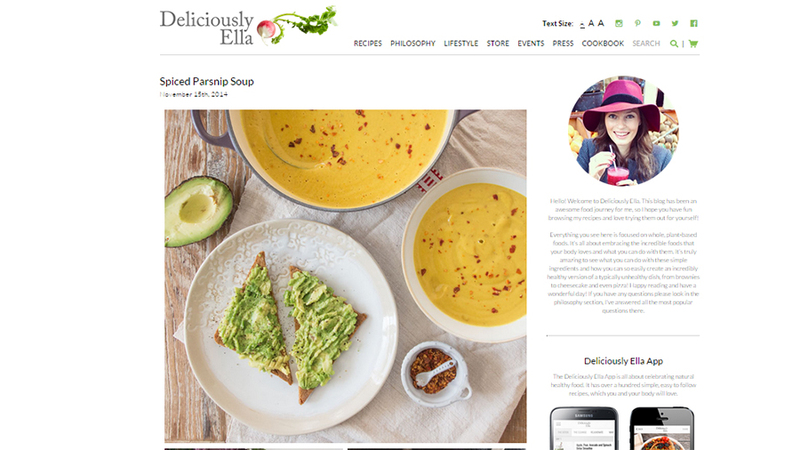 When I found her blog I think I read almost every recipe back to back for hours. Packed full of yummy healthy meal ideas with clearly labelled food tags (e.g Gluten Free, Vegan, Nut Free) it's so easy to read her blog and become inspired. Needless to say I have many recipes bookmarked and I can't wait to try some out. Deliciously Ella has some of the most inspiring mouth wateringly good recipes i've come across in a very long time. I love the fact that her recipes are so simple and easy to follow and her photography is just amazing. With a few London eatery recommendations mixed throughout, I've got a long shopping an eating list ahead of me. 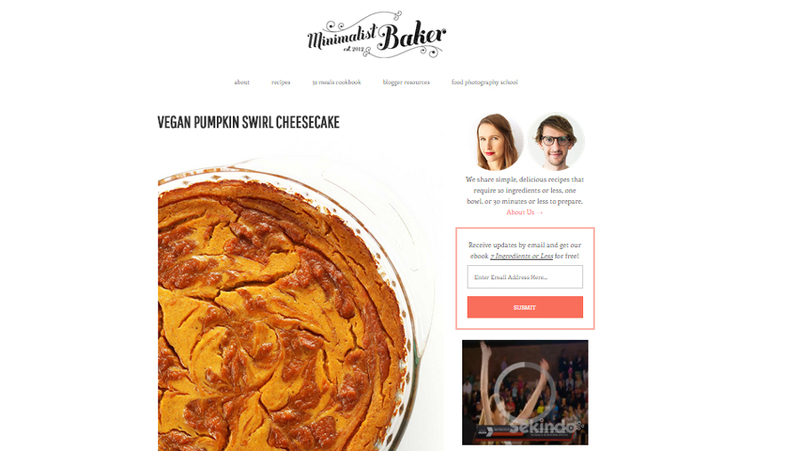 I first discovered the Minimalist Baker earlier on this year. They have a fantastic range of recipes that are easy to follow and packed full of beautiful photos. Theire Gluten Free Pizza base is on the top of my weekend bake list and I can't wait to get stuck in. These are my top 3 sources of inspiration for meal ideas and lifestyle changes, and I'd love to hear yours. If you have a favourite blog or website you think I should be reading, let me know in the comments! Will be checking these blogs out, I neeeeeed to start eating a bit healthier as well, but my problem is that I have no inspiration for what meals to make! Helpful post, thanks! After complete my reading this post i understand that , it's a awesome post .